The Yen Liang Young Artist Competition is an annual concerto competition presented by the Diablo Symphony Association, showcasing the depth of the young local talent in Contra Costa County and beyond. The competition is dedicated to the memory of Yen Liang (1908-2000), a noted artist, architect, and long time resident of Rossmoor who also played second violin in the Diablo Symphony for many years. The competition rotates every year between strings, winds/brass/percussion, and piano; the competition will be open to pianists in the 2018-2019 season. First prize winners of the Young Artist Competition are offered an opportunity to perform in two concerts with the Diablo Symphony Orchestra in the spring of 2019, as well as a $1000 cash honorarium. Applicants to the 2018-19 competition must be born after April 1, 1995, and must submit applications to the competition (including video recording) by no later than December 15, 2018. For the application form, please click here. 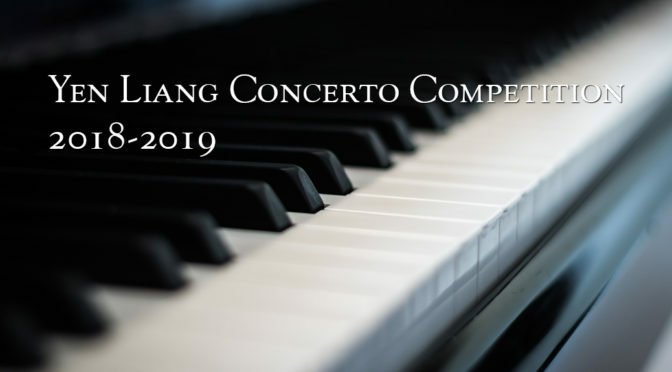 The final round of the concerto competition itself takes place at 4 pm on January 6th, 2019 at the Steinway Gallery in Walnut Creek. For more information about the competition, please consult the competition rules or contact Sharon Greene at [email protected].